Shakespeare has never been an easy thing for me to write about, not ever. I once fell asleep on my computer keyboard trying to write a paper about Shakespeare. Or maybe that was Faulkner. Let’s say it was Shakespeare. It’s been easy to put off writing a post about King Lear, because I so rarely feel like I have much of anything to say about verse. I am, after all, a mere veterinarian. But I’m up for a challenge today, so here goes. I just pulled out my notes from my two Shakespeare classes in college. I read King Lear in the Spring of 1997, and even wrote a paper on it that got me an A. The title of the paper was “Kent and Edgar and their eerily similar lives.” I just re-read it. It was okay. The ideas were hardly revolutionary and I think I could have done better coming up with a more interesting topic if I’d had more time and inclination. But that spring was the beginning of my becoming fully invested in/obsessed with my undergraduate job, which ultimately led me to my chosen career, and I was less into my academic life than one would expect of a person considering professional school. (I’ll let you guys in on a little secret: when applying to vet school, good work experience and letters of recommendation make middling undergraduate grades less important.) I phoned in my biochemistry class that quarter, and my physics class, and quite possibly my physiology lab. But I learned how to draw blood on cats! Totally awesome. But I digress. Here’s something else I would have liked to write about for that paper: Cordelia. Did queens routinely show up at battlefields in her day, or is she special? In addition, is she more noble for telling the truth to her crazy father when he demands his daughters profess their love for him in order to get their property, or is she an idiot for not just repeating the platitudes uttered by her sisters? I suppose she was trusting in her father’s ability to see through the nonsense. But apparently old folks in Lear’s day liked to hear themselves be flattered more than wanting to hear the truth. Christopher Moore has a book called Fool, which is King Lear told from the point of view of the Fool (obviously). In that book, Goneril and Regan are competing for Edmund as well as both making the beast with two backs with the Fool. I was so confused about this when I read that book a couple years ago, but I think I may have missed all the oblique sexual references towards the end of the play when I was twenty, as well. 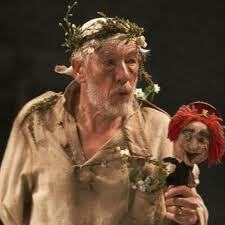 I’d love to reread Fool and compare it with the original King Lear. That isn’t exactly a high literary pursuit, but it’d be fun to do. The words in this play have power for me in a way that is different from Measure for Measure. I actually remember Fr. Murphy, or possibly my professor in college, reading aloud from King Lear. The one that has resonated for me for all these years is something Gloucester says in Act IV when Edgar is tricking him into not flinging himself from the white cliffs of Dover: “As flies to wanton boys, are we to the gods, /They kill us for their sport (IV, i, 36-37).” It’s primarily the second part, really, that I remember. Isn’t that the most hopeless line in all of literature? Probably not, but it’s the most hopeless line I have read in a while. Hopeless misery was a theme that was near and dear to my heart when I was in my early twenties and late teens, so perhaps that’s why King Lear is so much more memorable to me than Measure for Measure was. I’m curious to see how much of Hamlet I remember when the AP English Challenge comes to a close in August. In the months since we started this reading challenge, I’ve made a lot of interesting discoveries about myself. Like I don’t hate Joseph Conrad, or Henry James, and sometimes the bad guys are more interesting to write about than the good ones. Something hasn’t changed: Shakespeare isn’t any easier to get through at thirty-six than it was at sixteen or thirteen. But at thirty-six, I can see the importance of making the effort. This entry was posted in AP English - 18 Years Later, Book-related personal narratives, Drama, Reviews by Jill, William Shakespeare. Bookmark the permalink. I sometimes wonder what Fr. Murphy would think about us doing the AP English Challenge. I think that an argument could be made for Lear not going crazy until his daughters completely reject him. But it seems to me that he isn’t completely with it when he rejects his favorite daughter because she won’t play his ridiculous “who loves me more game.” I mean, I’m sure he is vain, but that just seems like a stupid move. Probably it’s vague purposefully, so whoever is playing Lear can make up his own mind how to present the character. I think the play only works if we assume that Lear is already in mental decline in scene 1. I think there’s some evidence for this in Kent’s quickness to caution Lear against banishing Cordelia – it’s as if he’s already on the alert for strange behavior from Lear. I’ll be writing about this a bit when I write my final thoughts. To me, if he is thinking clearly at the beginning, then he’s just an awful, vengeful person who deserves what he gets, and not a tragic hero. Okay, I defer to you both on Lear’s sanity. I just sort of thought he was old and used to being pandered to, like so many powerful people. Maria, I do think the question of at what point Lear starts to lose his sanity is an important one and not at all clear in the play. One of the reasons I plan to write about it is that I think it is ambiguous, and at least for me the motivations of many characters hinge on it. Also, have you read Jane Smiley’s A Thousand Acres? It’s King Lear retold in 1980’s Iowa, and Smiley does a really interesting job of explaining the erratic behavior of all three daughters. I tried to read the Smiley book but I found it too grim and horrible, and it took too long. I suppose I ought to try again. It was summer reading for Ruth before her senior AP English class. Also, Fools often hold a stick with a head on it which they use like a ventriloquists dummy, or something. Lear holding it would have been a pretty clear symbol that he was a fool at that point. I read the Smiley novel in college and liked it a lot, but I have a pretty high tolerance for grim and horrible in general and had an ESPECIALLY high tolerance for it when I was younger than 30. I was a late bloomer in the compassion department. Also, Jill, I’m curious about the doll King Lear is holding in the photo you used. I don’t remember him having a doll in the play. Any idea what that’s about? I was thinking it could be one of those head-on-a-stick things that the Fool carries around and talks to. Head-on-a-stick things? I don’t remember those either. Which act are those in? Thank you so much! I’ll do my best to keep it up!